We are honoured to be in the presence of such revolutionary, struggling women. We are especially grateful to our Indian comrades for hosting us and making this historic gathering possible. On behalf of the Kurdish women’s movement, we salute you and your resistance. We thank the organizers for dedicating the venue hall to our precious comrade Sakine Cansiz. Sakine Cansiz, nom de guerre Sara, born 1958 in Dersim, was one of the co-founders of the Kurdistan Worker’s Party. She was detained in 1980 in the infamous military prison of Diyarbakir, where she was tortured brutally. As a leading figure of the prisoner’s resistance she became a living legend. After her release in 1991, she joined the Kurdish guerrilla. She played a special role in the founding of the Kurdish women’s guerrilla and the autonomous organisation of women within the Kurdish liberation movement. On January 9, 2013 together with two of her comrades, Fidan Dogan and Leyla Saylemez, she was assassinated by the Turkish intelligence in Paris/France. , Comrade Sara has been a symbol for women’s resistance during her lifetime and continues to drive our struggle beyond her death. I will read out a joint presentation written by Monika Gärtner-Engel, the former European coordinator and a provider of ideas for the World Women’s Conference and this seminar – and by myself. Monika is also the co-author of the book, New Perspectives for the Liberation of Women, which has been translated into seven languages to date and is studied and discussed in many countries worldwide. Unfortunately, she cannot participate herself but sends us warm greetings and best wishes for success. Although she cannot be present we asked her to contribute to this speech on the topic, which is based on the above-mentioned book! I will now read out the contribution. During recent years, the international militant women’s movement has obviously strengthened itself, accomplished great achievements through struggle, and has made significant progress. Thousands of female workers of You Li International in Cambodia have been fighting since July. Shorter time allowances worsen the working conditions. The wages of the workers who do not fulfill the targets are cut; this also applies to pregnant women. In Swaziland on 18 September, 10,000 female and male workers from five textile plants went on strike for higher wages and better working conditions – despite being violently attacked by the police. Since the end of September, in Indonesia thousands of female workers of the garment factory PT II Jin Sun have been on strike, because their wages have not been paid for months. For two months, female textile workers in Myanmar went on strike for better working conditions. Their demands were largely fulfilled. The management sent in gangs of thugs. Since that time, the women have been organizing a protest camp in front of the gates. At the end of October 3,000 female workers of the garment factory Ivory Vietnam went on strike against too many extra shifts, low extra pay, and too expensive canteen meals. Conclusion: more and more women are becoming part of the international industrial proletariat and the working class. They constitute the backbone of the militant women’s movement. The numerous female textile workers are in the vanguard worldwide. In many countries of the world, women’s consciousness has awakened on a massive scale! In many countries, on International Women’s Day 2019, the women’s movement chooses the “strike” as a form of protest, following the example of the workers’ movement. The struggle for the liberation of women is on the agenda in the 21st century. Women of all social strata and classes are at odds with the capitalist system, its representatives in the bourgeois parties and governments. But the contradiction is often still limited to individual questions and demands and is non-binding in its form. In order to become a force that can change society, it needs clarity and organization. 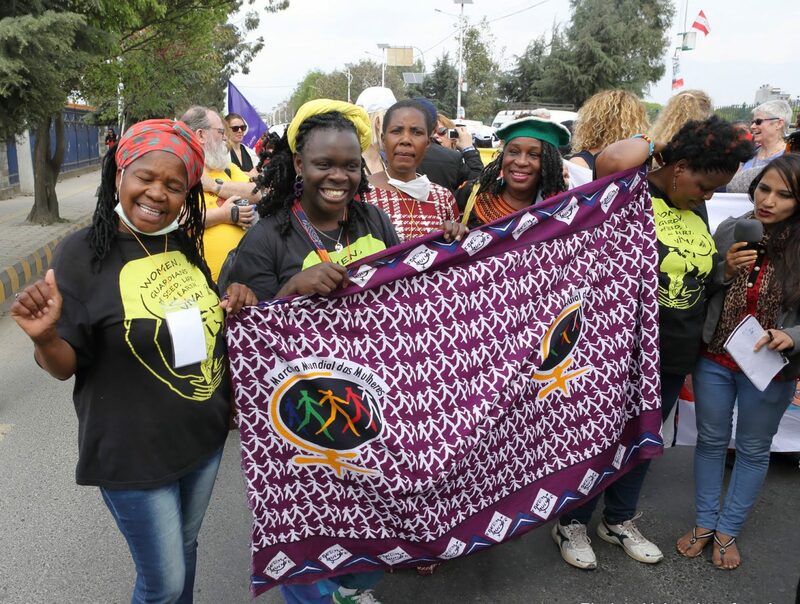 From Africa to Europe to Asia female workers fight organized for their equal rights and participation in social life. In India, Sri Lanka, female tea plantation workers are on strike for equal wages with their male colleagues. Female textile workers in Bangladesh are fighting union battles for wages they and their families can live on. Women farmers demand a right to land. The approximately 67 million domestic workers worldwide demand employment contracts and social security, protection against sexual violence and an end to lawlessness. Carers and nurses in the Netherlands and Germany fight for recognition of their work and higher wages. Women are climbing the highest mountains! This was the motto of the six-days of the self-organized World Women’s Conference of grassroots women in Kathmandu, Nepal. 1,300 participants from 48 countries took part, including 74 delegates from 40 countries and more than 200 volunteer helpers. In ten workshops, the participants discussed central issues of the women’s movement. Women’s organisations from 61 countries were actively involved in the preparation programme. About the Kurdistan Women’s Liberation Movement: Having a history of 40 years in total, the women within the Kurdish National Liberation Struggle are organising themselves autonomously since the early 1990’s. This process that started first within the guerrilla ranks by establishing a women’s guerrilla army today has reached a level of equal participation and representation in all parts of the struggle. Inside the women are organised autonomously and are the ones that take all decisions on women. But the ideological and practical struggle for true liberation continues as it aims to liberate both women and men from the patriarchal and capitalist-modernist mind of state. The women’s struggle within the Kurdish liberation movement marks a revolution within a revolution. It is based on the idea that true revolutions must be female; that liberation theories and ideologies need to take the issue of women’s liberation in it’s centre. The one who started first analysis on women’s status within the society and the liberation of women was the founder and leader of the Kurdistan Workers Party (PKK), Abdullah O He was abducted through a NATO-operation in 1999 and since then kept in solitary confinement on a prison island in Turkey. Sakine Cansiz, nom de guerre ‘Sara’, was one of the first female revolutionaries in Kurdistan. Cansiz was founding member of the PKK. She was imprisoned in 1980 and brutally tortured. By leading the resistance in the prisons against the colonialist Turkish state she became a living legend. She was at the same time a living history of the Kurdish women’s liberation struggle. On January 9, 2013 Sakine Cansiz, together with her comrades Fidan Dogan and Leyla Saylemez, was assassinated by the Turkish intelligence service in Paris/France. 23.11.18: The All India Revolutionary Women’s Organisation (AIRWO) is proud to host the International Theoretical Seminar on the Liberation of Women from 2nd – 4th December, 2018, in Bengaluru. The Seminar, which will be held in Spoorthidhama, Anjananagar, Bengaluru, is an initiative of the World Women’s Conference, an international coordination of rank and file women working to build a global solidarity of struggling women. AIRWO has been a part of the World Women’s Conference since it began its journey in Venezuela in 2011. The decision to hold an international theoretical seminar was adopted by the Second World Women’s Conference held in Nepal in 2016. The three-day international seminar will have participants from countries of Asia, West Asia, Africa, Europe and Latin America. There will also be around 200 participants from around 15 states of India. Women from across the world will speak and interact on the problems confronting women’s liberation, possible strategies to overcome the same and efforts to build a just and egalitarian society. The emphasis of the seminar will be on exchange and interaction rather than one-way deliberations.